Update : iOS 4.3 released ! Apple has just pushed a minor update for the second-generation Apple TV owners. While there is no official change log yet, this update seems to be minor, mainly released to fix bugs and security loopholes. 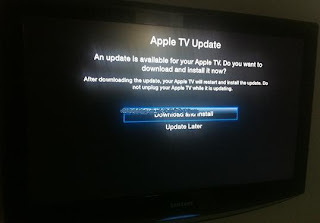 The build which is marked as iOS 4.2.1 (8C154) is reported by Apple TV as iOS 4.1.1. The same thing happened last month too when Apple released iOS 4.2 for Apple TV, and it was reported on the device as iOS 4.1. The main highlight of iOS 4.2.x for Apple TV is the video AirPlay feature that will allows you to stream pictures, videos and music right from your iPhone, iPad or iPod touch to TVs connected to the second-gen Apple TV. Last iOS update for iPhone, iPad and iPod touch was iOS 4.2.1 which released on November 22 last month. See all the new features of this new software update in the video walkthrough embedded below. The big new feature in the update today is support for AirPlay, a new Apple technology that allows devices running iOS 4.2 or Macs and PCs running iTunes 10 to stream video over a local network and have it played back on a TV set via the Apple TV.